Lawrence Free State extended its winning streak to five games after a 31-14 over Manhattan. Free State quarterback Bryce Torneden threw for three touchdowns and rushed for 157 yards in the win. Shawnee Mission West rolled Shawnee Mission South 56-0. SM West rushed for 364 yards and seven touchdowns. Kirby Grigsby found the end zone three times, while Nigil Houston led the team with 126 rushing yards. Shawnee Mission North earned a 64-14 win over KC Harmon. SM North quarterback Will Schneider threw three touchdowns and rushed for two more in the win. Olathe Northwest beat Olathe East 24-7 to improve to 6-2 on the season. The Ravens and Falcons went into to locker room scoreless before Northwest scored twice in the third quarter to take control of the game. Topeka Seaman earned a playoff spot in Class 5A District 2 with a 48-7 victory at Topeka Highland Park. Tailback Colton Moranz had 20 carries for 150 yards and caught four passes for 92 yards. Quarterback Dalton Cowan completed nine passes for 164 yards and three scores, and ran for another score. Kapaun Mount Carmel earned their sixth win of the season after 51-27 win over Andover. Freshman Nick Channel touched the ball four times, scored two touchdowns and ran for 130 yards in the win for the Crusaders. Wichita Heights held off a late Emporia rally to escape with a 27-25 win on Friday night. Senior running back Rodney Murphy rushed for 258 yards and three of Heights’ four touchdowns on the Falcons senior night. Goddard-Eisenhower clinched the school’s first playoff berth in its fourth season by beating Liberal 27-6 on Friday night. The Tigers took a 21-0 halftime lead behind two short touchdown runs from Joseph Weibel and a 2-yard run from Adam Brown. Ulysses improved to 7-1 on the season after a 57-7 win over Rose Hill. Javian Bencomo and Abraham Romero combined to score five touchdowns in the win. Romero rushed for 129 rushing yards, while Bencomo added 133 yards on the ground on seven carries. Mulvane improved to 4-4 on the season with a 42-30 win at Wellington on Friday night. Jayden Price led the way for the Wildcats with 20 carries for 201 yards and three rushing touchdowns, while completing 13 of 20 passes for 152 yards and another score. Keaton Shoemaker added 123 yards and two scores on 12 attempts. Augusta rolled Coffeyville 42-6 to improve to 7-1 on the season. The Orioles were led by Luke Dockers who rushed for 112 yards and two touchdowns. Cody Westbrooks also returned an interception for a 51-yard score. He added a 24-yard touchdown reception later, part of Zach Barclay’s three-touchdown passing night. Andover Central cruised to a 70-6 win over Towanda-Circle. Jordan Birch rushed for a game-high 212 yards and three touchdowns, while quarterback Peyton Huslig threw for three touchdowns. Wichita Trinity improved to 6-2 on the season after a 52-7 rout of Haven. Sam Schroeder scored four touchdowns and cruised to victory. Schroeder finished with 226 yards on 28 carries. Wamego came from behind to beat Smoky Valley 18-14 to earn back-to-back wins for the first time this season. The Red Raiders trailed 6-0 after the first quarter and 14-12 at the half before Dillon Blain connected on a 30-yard pass completion to Hunter Loewen for the eventual game winning touchdown. Girard earned their first shutout of the season with a 26-0 rout of Burlington on Friday night. The Trojans led 20-0 at halftime before adding one more score in the second half. Quarterback Eric Wilson threw two touchdown passes and ran for another in the win. Nickerson improved to 4-4 on the season after shutting out Chapman 44-0. On senior night, the Panthers dominated on both sides of the ball. The offense rushed for 378 yards while the defense held the Fighting Irish to a mere 94 yards of total offense. Cheney scored a late fourth quarter touchdown to come away with 35-28 win over Chaparral on Friday night. The Cardinals built a 21-0 lead behind three touchdowns from Austin Ray. Chaparral tied the game at 28-28 before Cheney sophomore quarterback Micah Grover found Brandon Jones for the go-ahead 4-yard touchdown. Conway Springs improved to 5-3 and broke a two-game losing streak with a 50-16 win over Belle Plaine. The Cardinals scored 38 first-half points to take command. Colton Terhune completed four touchdown passes to Josh Dugan. Hesston moved to 7-1 on the season with a 27-0 shutout win over Council Grove. Zach Esau threw for 144 yards and two of the touchdowns in the win for Swathers. St. Mary’s Colgan improved to 6-2 on the season and 2-0 in district play after a 31-8 road win at Humboldt. The Panthers took advantage of four Cub turnovers and scored on the first play from scrimmage after quarterback Ryan Cedeno connected with Garrett Normand for a 65-yard touchdown. Clayton Herdman led La Crosse to a 42-0 shutout win over Leoti-Wichita County. The junior quarterback accounted for two rushing touchdowns and one passing touchdown in the win for the Leopards. Ellis smacked Sublette 64-6 to improve to 5-3 on the season. The Railers put up 50 points in the first half and seven different Ellis players scored in the blowout. Ellis has now won five of its last six games and will play Plainville this week with the winner qualifying for the playoffs. Mission Valley escaped Northern Heights with a last minute 28-22 win. Quarterback Clay Phillips found Andrew Metzger for the game-winning 36-yard touchdown with 46 seconds remaining in the game. Phillips also rushed for 132 yards and two touchdowns in the win. Lyndon came away with a 52-14 win over Yates Center. 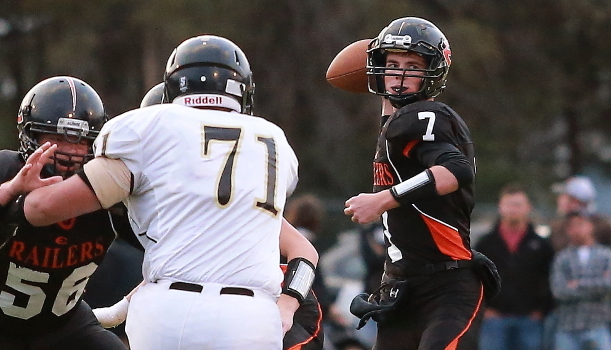 Tiger quarterback Rylan Burns threw four touchdown passes, while Dexton Swinehart ran for 113 yards and two scores. Swinehart was also on the receiving end of two Burns touchdown passes. South Central rolled past Macksville 54-6 to improve to 7-1 on the season. Cole Lohrding and Gerald Morehead ran all over the Mustangs defense with a combined 285 rushing yards and five touchdowns. Uniontown remained undefeated after stomping Pleasanton 52-6. The Eagles put up 38 points in the first quarter and added the remaining 14 points ending the game at halftime. John Reed rushed for a pair of touchdowns, while quarterback Gavin Miller threw a touchdown pass to Tommy Joles. West Elk improved to 8-0 on the year after a 54-8 blowout of Oxford. Cade Miller and Armando Gomez each scored twice while rushing for a combined 112 yards in the win. Gomez also had a kick return touchdown and a punt return touchdown. Pratt-Skyline earned a second win of the season by running over Kinsley 66-26. The Thunderbirds rushed for eight touchdowns on the night. Justin Hampel found the end zone four different times behind his 106 rushing yards. Brady McComb found pay dirt three times with 103 yards rushing, and Andrew Withers led Skyline with 226 rushing yards and added the final rushing touchdown. Ingalls cruised to a 66-0 shutout win over Deerfield on Friday night for their seventh win of the season. Zean Cox rushed for 144 yards and four touchdowns, while twins Branson and Dawson Sandoval each scored twice for the Bulldogs. Ashland shutout Fairfield-Cunningham 46-0 and earned their sixth win of the season. The Blue Jays rushed for 208 rushing yards and five touchdowns in the win. Chase remained undefeated after running over Tescott 52-6. Kebren Julian had seven carries for 82 yards and three touchdowns for the Kats in the win. Pike Valley earned their second shutout of the season after a 44-0 win over Linn. The Panthers scored 22 first-quarter points to take complete control of the game and led 38-0 at the half. Pike Valley held the Bulldogs to just 132 yards of total offense in the game.